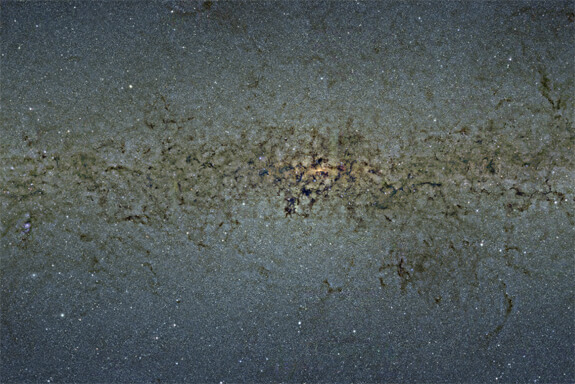 From a rocky mountain at the heart of Chile’s Atacama desert, scientists used the Visible and Infrared Survey Telescope for Astronomy‘s (VISTA) massive 4.1 meter-wide mirror to capture the above image of the central Milky Way galaxy, pinpointing more than 84 million stars in the most detailed survey of its type. The image, captured by looking at the infrared light streaming from the heart of our home galaxy, says the European Southern Observatory, “would be 9 metres long and 7 metres tall” if printed out at a typical print resolution. Or, in way more fun terms, if printed as a carpet, this gorgeous view could cover the floor of a 675-square foot apartment. As Skymania‘s Paul Sutherland points out, there was of course a scientific purpose to putting together this whopping nine-gigapixel image. Cataloguing the many millions of stars in this one small central region of the Milky Way will help scientists understand more clearly what lies at the centre of our galaxy and how it developed. That, and it’s really, really pretty.